When you think of business and investment opportunities in the United States, where’s the best place to start? America is made up of 50 states plus territories and each location has its own unique economic profile. The U.S. Cluster Mapping Tool, a combined effort of the Harvard Business School and the U.S. Economic Development Administration, is THE starting place for anyone looking to expand their business in the U.S. 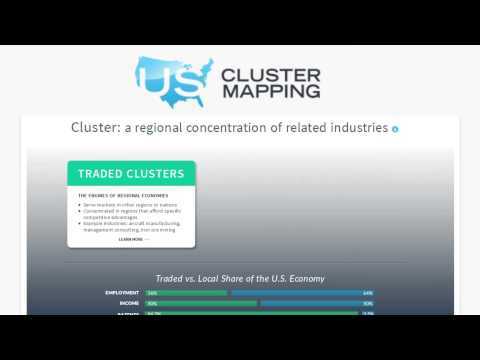 The free, online Cluster Mapping tool uses more than 50 million data records to help you identify industry regional clusters and make informed investment decisions. With more than 2,600 people from more than 70 markets, and economic development organizations from all corners of the United States, the 2015 SelectUSA Investment Summit has record attendance. In fact, it is more than twice as large as the inaugural 2013 event and reflects growing global interest in the United States as a place to launch and expand operations, invest in research and development, and create jobs. 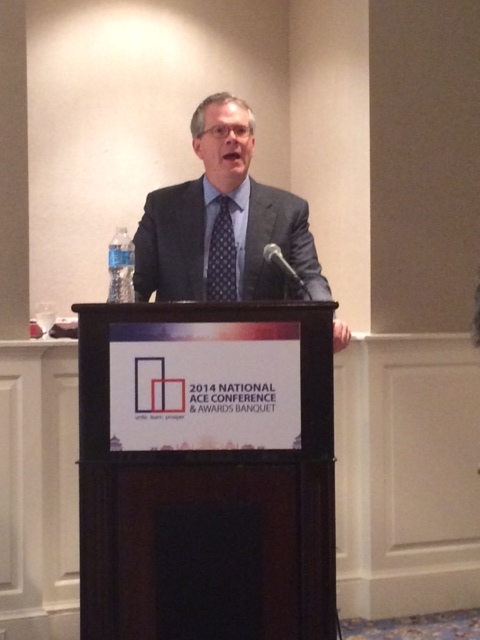 Day One of the 2015 SelectUSA Investment Summit just concluded and what an exciting day it was. We were honored to have President Obama speak and announce some new initiatives to make investing and expanding within the United States even easier. He announced that the U.S. Citizenship and Immigration Services will increase clarity around the adjudication of the L-1B non-immigrant visa that allows international companies to temporarily deploy workers with specialized knowledge to the United States when launching or conducting operations here. This long-anticipated policy guidance is of particular interest to global companies participating in today's SelectUSA Investment Summit. Commerce Secretary Penny Pritzker will establish the first-ever federal advisory committee to solicit formal input on the development and implementation of strategies and programs to attract and retain foreign direct investment in the United States. Finally, SelectUSA will continue to improve investment tools, enhance trainings for investors, and expand partnerships with state economic development organizations. A new partnership platform will improve state-federal coordination, inform SelectUSA services and programs, and promote high standards in investment-promotion activities across the country. Today, as part of the Select USA Investment Summit, I had the honor of joining an impressive group of business leaders, international investors and experts for an in-depth conversation about how innovation and R&D is helping to fuel private sector investment, and why the United States is poised for tremendous growth. I’d like to applaud U.S. Commerce Secretary Penny Pritzker for bringing together more than 2,500 participants representing 60 countries, drawing international attention to the U.S. as a premier country to invest in at such an optimal time. International companies representing countries from around the globe, such as Germany, contribute largely to Federal Direct Investment (FDI) and find the U.S. an attractive place to invest. And Siemens does too. To give you a little bit of background, Siemens is one of the world’s oldest and biggest companies. Having been in the U.S. for over 150 years, we currently employ nearly 50,000 people throughout all 50 states and Puerto Rico. 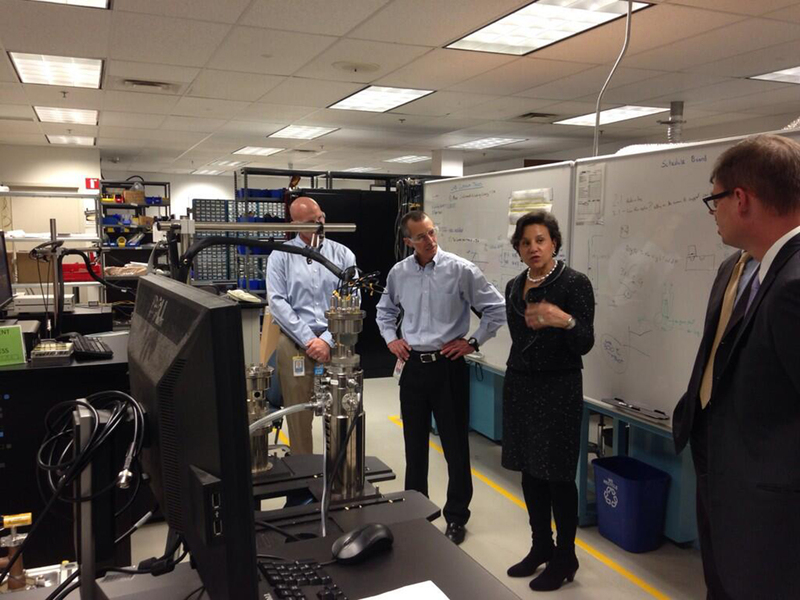 We have more than 70 manufacturing sites in the U.S. and invest more than $1 billion annually in R&D here. The U.S. has become an innovation engine for Siemens. It is not only our largest market, but is also an extremely vital production location, one of our most important research centers and a key base from which we export to the rest of the world. Siemens has invested over $35 billion in America over the past decade, including over $10 billion in the past year alone. So why invest in the U.S.? As a global company, when we are looking for a new location to invest or to manufacture, we consider many factors and there are several which are unique to the U.S. market, giving it a leg up on the competition. It’s clear that the primary trait that sets the U.S. apart as a unique and unrivaled place to invest is an undeniable spirit of innovation. The U.S. has an environment of innovation, collaboration and talent that is unmatched anywhere in the world. 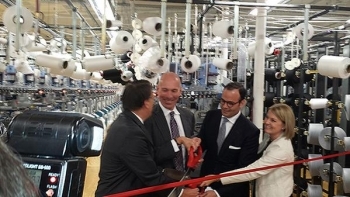 On Wednesday afternoon, I delivered remarks in Hilderbran, North Carolina at a ribbon-cutting ceremony where we officially opened the new Canadian-based Peds® Legwear (PEDS) production facility. PEDS’ recent $16 million investment in the plant and new machinery has allowed the company to hire North Carolina factory workers who were previously laid off. By 2018, this new facility will bring more than 200 jobs to Hildebran, providing a lift to the local economy. SelectUSA, our program to attract foreign direct investment (FDI), along with our Commercial Service Canada team, helped facilitate this deal. SelectUSA provided counseling to PEDS on how to navigate the federal regulatory process and also helped identify sources of federal funding. In addition to PEDS’ investment in the Hildebran facility, the company plans an additional $8 million venture, bringing their total investment in the United States to $24 million. In less than two weeks, similar FDI deals will be highlighted at this year’sSelectUSA Investment Summit, which will take place March 23-24. In addition to ITA’s support, PEDS’ new investment is made possible because of a multi-year purchase order contract from Wal-Mart as part of the retailer’s commitment to buy domestically produced goods. As I noted in my remarks—before an audience that included Michael Penner, president and CEO of Peds®Legwear; Cindi Marsiglio, Wal-Mart’s vice president of U.S. manufacturing; and North Carolina Governor Pat McCrory—PEDS’ investment in the facility shows our nation’s prowess to attract FDI. Because the United States offers a transparent, fair, and stable business climate, as well as our second-to-none workforce, many global companies like PEDS are beginning to establish or expand operations here. In fact, in 2013, U.S. FDI inflows totaled $231 billion, of which $51 million was invested in U.S. textile and apparel manufacturing. In 2012, majority-owned U.S. affiliates of foreign firms accounted for $48 billion in R&D expenditures, exported $334 billion worth of U.S. goods exports, and employed nearly 6 million workers. To keep the momentum, ITA will continue to develop opportunities for U.S. workers and businesses by promoting international trade, encouraging FDI, and working to foster a level playing field for American products and services. There has never been a better time to invest in the United States. With a resurgent economy and a strong economic foundation to support growth for years to come, it is no wonder the United States is the world’s top destination for businesses looking to expand. Building on this, President Obama is hosting the second SelectUSA Investment Summit, which is right around the corner. On March 23-24, more than 2,500 people from around the world and every corner of the United States will gather in Washington to explore opportunities to grow their businesses. This is a “don’t miss” event, and we are excited to unveil the Summit agenda. We hope you will consider joining us. More than 1,200 people from 70 international markets have already registered, and we anticipate that the event will be filled to capacity well in advance of the Summit. Why is interest so strong? The United States offers an unprecedented investment climate for foreign investors of all sizes, a skilled and productive workforce, an unmatched higher education system, strong intellectual property protections, a serious commitment to innovation, and an abundant and stable energy supply. The U.S. domestic market remains the world’s most attractive for foreign investment. Real GDP grew at a 5.0 percent annual rate in the third quarter of 2014, and businesses have added 11.2 million jobs during a record 58 straight months of private-sector job growth. U.S.-based companies offer access to millions of global consumers through high quality Free Trade Agreements. More than ever, the U.S. market is driving global competitiveness. How can investors learn more about this unparalleled opportunity? Attend the 2015 SelectUSA Investment Summit in Washington, D.C., March 23-24, of course. 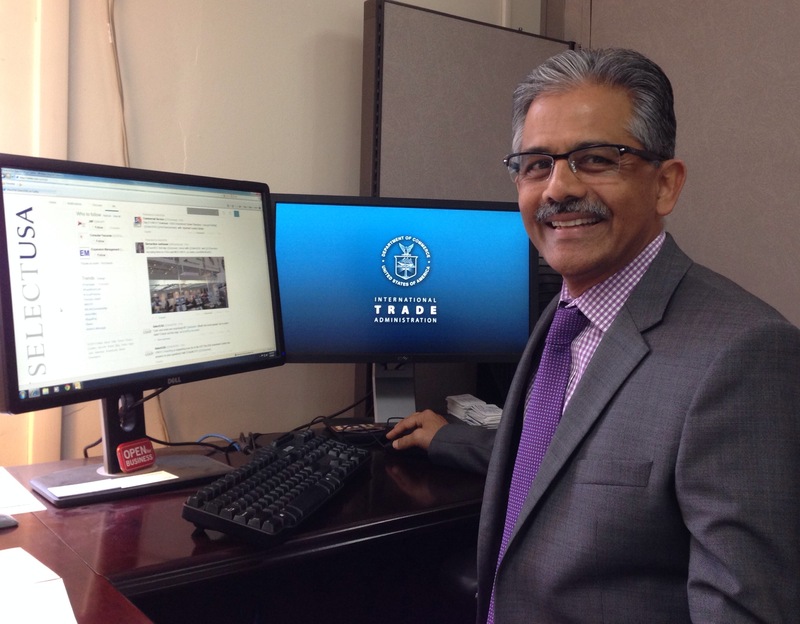 Guest blog post by Vinai Thummalapally, Executive Director of the SelectUSA Program. I recently had the great pleasure of participating in an exciting event with Secretary of Commerce Penny Pritzker in New Delhi. Hosted by the Federation of Indian Chambers of Commerce and Industry (FICCI), the event brought together business leaders, investors, and national business associations from across India. I had the opportunity to hear their ideas and share in their excitement about India’s fast-growing foreign direct investment (FDI) in the United States. Jobs: U.S. subsidiaries of Indian firms employed more than 43,800 workers in the United States in 2012, with an average yearly compensation of $69,800, well above the national average. Innovative R&D: In 2011, U.S. subsidiaries of Indian firms invested $46 million in research and development in the United States. U.S. Exports: U.S. subsidiaries of Indian firms exported goods worth more than $2 billion from the United States in 2012. These figures from the U.S. Bureau of Economic Analysis represent real stories of thriving businesses creating real jobs. SelectUSA, the U.S. government-wide program created to facilitate investment in the United States, has assisted several Indian companies as they sought to set up operations locally. 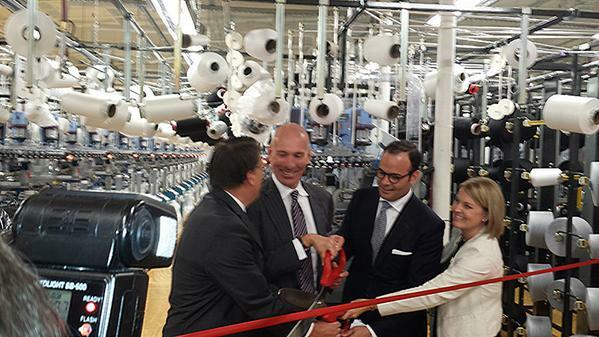 For example, Shri Govindaraja Textiles, or SG Mills, is a third-generation, family-owned business. The group is the largest spinner in India with a total workforce of 30,000 employees. Last year, SelectUSA and the U.S. Commercial Service office in New Delhi, helped company management develop and execute a work plan as they considered investing in the United States. Recently, SG Mills opened its first U.S.-based operation in Eden, North Carolina, and announced plans to invest more than $40 million during the next two years. 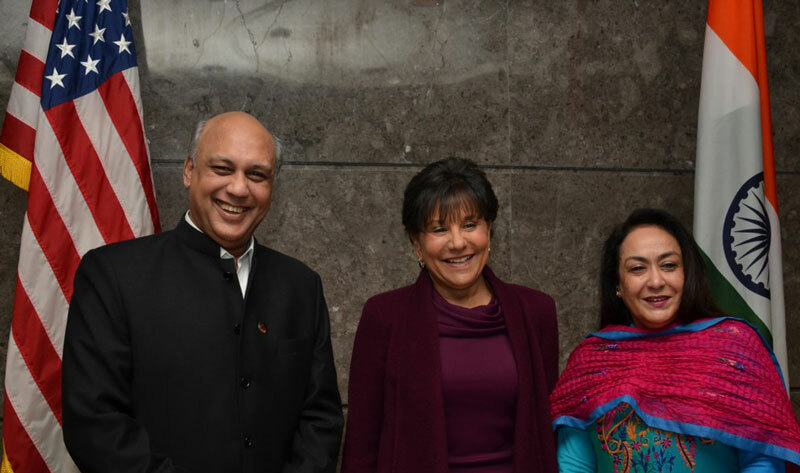 Secretary Pritzker today concluded a three-day trip to India, where she was honored to join the U.S. delegation traveling with President Obama. During the trip, she announced the expansion of the U.S.-India Strategic Dialogue to a Strategic and Commercial Dialogue (S&CD), reflecting the two countries’ commitment to strengthening commercial and economic ties. Secretary Pritzker will chair the new commercial components of the Dialogue. The elevated S&CD establishes a framework that will strengthen the U.S.-India relationship and create new avenues of cooperation between our governments, our businesses and our peoples. The new commercial element of our most important bilateral dialogue will focus on our shared priorities of growing our economies, creating good jobs, and strengthening our middle class. While the S&CD will be used to produce concrete results, the dialogue will also ensure that American and Indian businesses – small, medium and large – are in a position to capitalize on abundant opportunities that exist in both countries. In addition, the United States and India will use the dialogue to promote more trade and investment between both nations and to identify new opportunities for economic and commercial cooperation that will improve the lives of American and Indian citizens. 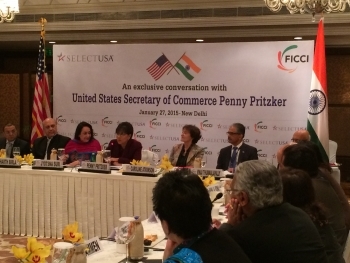 To build upon this announcement, Secretary Pritzker led a SelectUSA discussion with Indian CEOs interested in increasing their investments in the United States. The event was hosted by the Federation of Indian Chambers of Commerce and Industry (FICCI), India’s largest and oldest business organization, which was established in 1927. FICCI draws its membership from the public and private sectors, as well as various regional chambers of commerce. 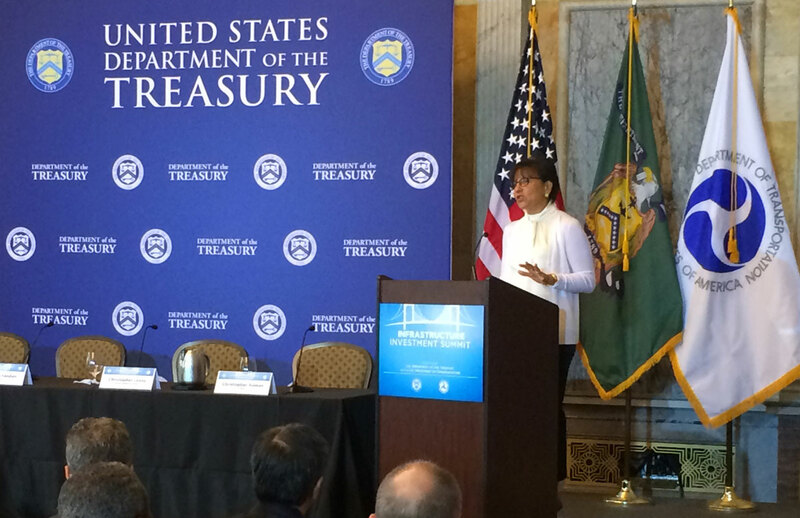 During the discussion, Secretary Pritzker emphasized that there is no better time to invest in the United States. She also highlighted the role that organizations such as FICCI and its member companies play in supporting SelectUSA’s efforts to promote more foreign direct investment (FDI) in the United States. 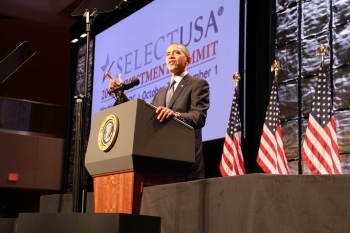 SelectUSA is a government-wide program, housed within the Department of Commerce, and will be hosting the SelectUSA Investment Summit on March 23-24, 2015. Caroline Atkinson, Deputy National Security Advisor for International Economics, Arun Kumar, Director General of the U.S. and Foreign Commercial Service, and Vinai Thummalapally, Executive Director of SelectUSA also joined Secretary Pritzker at the SelectUSA event. The United Kingdom and Ireland are both home to flourishing tech startups looking for the right opportunities to grow globally. The United States is the logical target for their expansion, especially given its 320 million consumers, free trade agreements with 20 other markets, and massive market for technology purchases. Furthermore, there is plenty of precedent. Companies from the UK and Ireland have outstanding track records of succeeding in our country. The UK is the largest source of foreign direct investment (FDI) in the United States, with $564.7 billion total stock as of 2013. According to the Commerce Department’s Bureau of Economic Analysis, affiliates of UK companies in the United States are responsible for more than 962,900 American jobs. Ireland is the eighth largest source of FDI, whose investors are responsible for more than $117 billion stock as of 2013 and 168,900 U.S. jobs as of 2012. Startups can also tap into the incredible resources available in the United States. Our entrepreneurial culture is the perfect business climate for startups to thrive. Just look at the numbers: According to the Kauffman Foundation’s Index of Entrepreneurial Activity, an average of 476,000 new businesses were created each month in 2013. The United States leads the world in innovation and intellectual property protection, accounting for roughly 30 percent of global research and development (R&D). In 2012 alone, companies from the U.K. and Ireland combined spent nearly $9 billion on R&D in the United States, contributing significantly to the intellectual diversity of all three countries. So how can SelectUSA, the U.S. government-wide program to facilitate investment into the United States, help even more companies to make the leap across the Atlantic? SelectUSA provides information, connects businesses with the right people, and helps investors navigate the federal government (learn more about our full range of services). In addition, the Commercial Service (CS) in the U.K. and Ireland launched a new initiative in 2014—SelectUSA Tech—to give early-stage technology companies the tools that they need to launch their businesses in the United States. SelectUSA Tech’s 2014 “boot camp-style” events in London, Dublin, Edinburgh and Belfast brought together public and private-sector experts to address legal, tax, accounting, insurance, and visa/immigration issues, while also covering how tech entrepreneurs can access U.S. buyers, venture capital, debt financing, and general banking services. A final, key component of the events has been a “lessons learned” panel of local startups, who share their experiences launching and scaling stateside. For more information about SelectUSA Tech Seminars, check out the flyer from September’s Edinburgh event or the highlights reels from our London or Dublin events. We also regularly participate in tech conferences and at incubator briefings. For example, over the course of a single week in October, CS UK held a SelectUSA Tech Seminar in Belfast, hosted a LDNY (London-New York Festival) #scaling2cities tech entrepreneur event at the U.S. Embassy, and co-sponsored “The Transatlantic Startup” event organized by the Global Innovation Forum. Startups can also learn more about the U.S. market at the 2015 SelectUSA Investment Summit coming up in March, which will enable entrepreneurs to meet with economic development offices from across the United States, all in one building. The day before the Summit, we’ll also be holding a SelectUSA Academy to present the basics of investing and launching a business in the United States at a level of detail that will be particularly useful for startups and entrepreneurs. To learn more about our SelectUSA Tech, please follow us on Twitter @SelectUSATech. 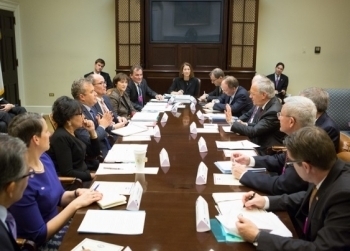 Today, U.S. Secretary of Commerce Penny Pritzker, Secretary of Labor Tom Perez, NEC Director Jeff Zients and Senior Advisor to the President Valerie Jarrett, hosted a delegation of Swiss business leaders, who are making significant U.S. foreign direct investment (FDI) in the United States. The eight executives announced plans to invest $3 billion in their U.S. operations in 2015. 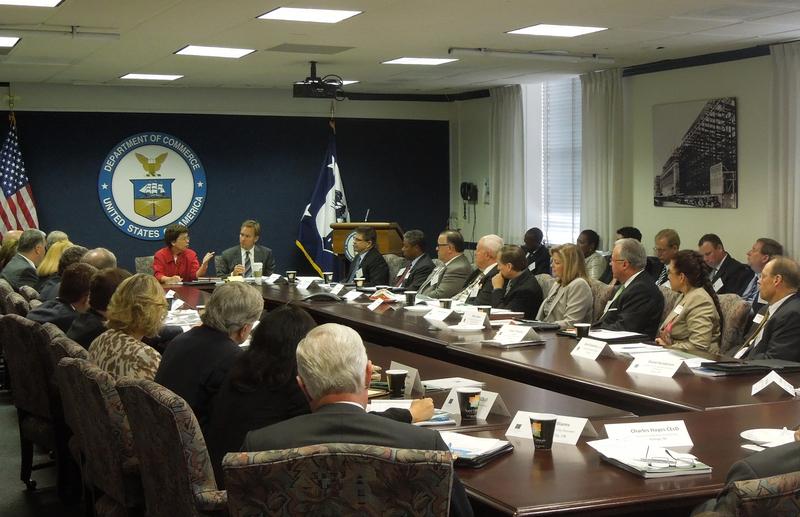 The participants also discussed the importance of job-driven workforce training initiatives, which enhance the United States’ attractiveness as a destination for investment by better enabling employers to hire workers with the necessary skills and providing employers with the technical assistance needed to launch training programs. The U.S.-Swiss diplomatic relationship dates back more than 160 years and currently, the U.S.-Swiss trading relationship totals nearly $100 billion annually. The total value of Swiss FDI in the U.S. has more than doubled between 2009 and 2013, growing from $65 billion to $140 billion, making Switzerland the 6th largest source. Additionally, Swiss investors are the top international source of R&D investment in the United States, spending nearly $9.4 billion in 2012. U.S. subsidiaries of Swiss firms employed over 472,200 U.S. workers in 2012, with an average annual salary of over $99,091. The apprenticeship model has become a major tool for developing a skilled workforce. Today’s meeting provided an opportunity for Swiss business leaders to share their experiences with apprenticeships and how that model can be expanded in the U.S. By partnering with Swiss companies to expand and start new registered apprenticeship programs, the pipeline of U.S. workers for in-demand jobs will be strengthened. The investor delegation also covered the importance of SelectUSA, a government effort to attract, retain and expand business investment to and within the United States. SelectUSA leads the Interagency Investment Working Group to ensure investors, get the answers and assistance they need across the federal government. SelectUSA provides services to international investors of all sizes and U.S. state, regional and local economic development organizations (EDOs). The upcoming Summit will showcase investment opportunities from every corner of the United States, while high-profile business and government leaders share their insight on the latest business trends. Are you looking for statistics on new investment by foreign companies in the United States? The Bureau of Economic Analysis (BEA) has you covered. New statistics slated to be unveiled later this year will provide information on things like when a foreign company launches a new business in this country or expands an existing one by building a new plant. The new data will give foreign entrepreneurs even more tools to make informed decisions about investing and hiring in the United States. The new statistics also will help guide national policy and state programs that aim to attract foreign direct investment and improve job opportunities in the United States. The new statistics provide information on “greenfield” investment – investment that occurs when a foreign firm establishes a new U.S. business or expands an existing one by building a new plant or facility. The statistics also cover the acquisition of U.S. businesses by foreign companies. In June, we released data showing that the cumulative value of foreign direct investment in the United States rose to $2.8 trillion in 2013, from $2.6 trillion in 2012. In July, we released comprehensive data on direct investment, financial transactions, equity, debt instruments, reinvestment of earnings, and income for selected countries and industries. The statistics released in July also include direct investment positions, financial transactions, and income for all countries and industries. In November, we released data on the activities of U.S. affiliates of foreign multinational companies in 2012, including employment, sales, R&D expenditures, capital expenditures, and more. BEA’s suite of investment statistics provides an important way for businesses and policymakers to track foreigners’ desire to invest and strengthen job opportunities in the United States. Expanding the U.S. economy through inward foreign investment that leads to more and better American jobs is critical – and it is one of the Commerce Department’s strategic goals. SelectUSA is the U.S. government-wide program, housed within the U.S. Department of Commerce, to facilitate such investment into the United States. SelectUSA is hosting the second SelectUSA Investment Summit in the Washington, D.C. area on March 23-24, 2015! Investors will find the practical tools, information and connections they need to establish or expand operations in the United States. U.S. Deputy Secretary of Commerce Bruce Andrews last week spoke at the National Asian Pacific Islander American Chamber of Commerce and Entrepreneurship (ACE) Conference and reaffirmed the Administration’s commitment to strengthening AAPI businesses in the U.S. and around the globe. He showcased the Department’s wide array of programs available to help the AAPI community successfully grow their businesses and knock down barriers in the process. With more than two million thriving AAPI businesses, the Commerce Department is focused on providing the necessary tools to help AAPI entrepreneurs stay viable and competitive in the global marketplace through partnering with the Minority Business Development Agency (MBDA), International Trade Administration (ITA), Economic Development Administration (EDA), Census Bureau, and the SelectUSA program just to name a few. During his remarks, Deputy Secretary Andrews emphasized the important role the Department’s agencies play in assisting AAPI entrepreneurs and innovators in everything from providing business counseling and other federal government resources to protecting intellectual property rights more expediently to disseminating data that spawn new businesses and promote better decision-making in existing businesses. Today, there are more than 1.5 million AAPI-owned firms that generate more than $500 billion in revenue. They employ more than 50 percent of all workers in minority firms nationwide. MBDA National Director Alejandra Castillo also spoke to the chamber about the importance of leveraging strategic partnerships and export opportunities. MBDA currently has 44 business centers designed to assist businesses gain more access to contracts, working capital and global markets. They also opened the first ever MBDA Federal Procurement Center designed solely to help minority-owned firms with annual revenues of more than $1 million, such as AAPI businesses, overcome some of the challenges it has faced in the past when accessing federal programs. Through a myriad of services, MBDA has also helped AAPI entrepreneurs successfully gain contracts and enter into new markets around the world, including Vietnam, Mexico and the United Arab Emirates (UAE). ITA is also helping small- and medium sized businesses sell their products and services around the world, with more than 100 Export Assistance Centers across the U.S. that offer hands on marketing and trade and finance support. The Commerce Department remains steadfast in its efforts to continue helping AAPI businesses grow. This past weekend at the Asia-Pacific Economic Cooperation (APEC) Summit in Beijing, Deputy Secretary Bruce Andrews participated in a roundtable with some of China’s most influential business leaders to discuss fostering investment and innovation in the world’s two largest economies – the United States and China. Hosted by the State Department and Secretary of State John Kerry, the roundtable stressed the importance of cooperation between the United States and China to expand economic opportunities in both countries and strengthen global growth. Other U.S. government officials in attendance included Ambassador Max Baucus, Assistant Secretary for Economic and Business Affairs Charles Rifkin, and Deputy USTR Ambassador Robert Holleyman. During the discussion, Deputy Secretary Andrews promoted further foreign investment in the United States by explaining the importance of SelectUSA, the first-ever U.S. government-wide effort to promote, attract, retain, and expand business investment to and within the United States. Created by President Obama and led by the Department of Commerce, the inaugural SelectUSA Investment Summit in Washington, DC transformed into a sold-out event with more than 1,300 participants, including representatives of 450 foreign or multinational firms from 60 different markets. With China as the fastest growing source of direct investment in the United States, Deputy Secretary Andrews also recognized the positive contribution of China’s growing investment position. With this in mind, Deputy Secretary Andrews extended an invitation to attend the next SelectUSA Investment Summit in Washington, DC from March 23-24, 2015. After Deputy Secretary Andrews spoke, the Chinese business leaders provided brief overviews of their companies and experiences investing in the United States. This discussion underscored the U.S. government’s openness to investment from China and how a transparent and fair investment climate in China could help foster a healthy and positive economic bilateral relationship. APEC is central to U.S. economic engagement in the Asia-Pacific region, serving as the leading forum for facilitating trade and investment and promoting economic growth in one of the most dynamic regions in the world. The Department of Commerce’s participation in many APEC issues – including business ethics, cross border data privacy, disaster risk reduction, and oceans – reflects its commitment to strengthening collaboration with Asian economies in a range of sectors, and reflects the President’s message of support for existing multi-lateral institutions in Asia. Today, U.S. Secretary of Commerce Penny Pritzker met with representatives from the Japanese healthcare and energy sectors as part of a series of roundtables to discuss American and Japanese business relationships and improve U.S. investment in the Japanese market. These events are part of the Secretary’s trade mission to establish new partnerships and expand the market presence of U.S. medical/pharmaceutical and energy-related companies with innovative products and services. The roundtable provided U.S. and Japanese entities the chance to share views about the opportunities that exist in the Japanese market and to encourage the development of partnerships that may lead to future breakthroughs in the energy and health sectors. Secretary Pritzker also delivered a keynote address at an event sponsored by the American Chamber of Commerce in Japan (ACCJ) and the Japanese Industry Association, Keizai Doyukai. She opened her remarks by thanking Ambassador Kennedy, who is working side by side with the Commerce Department’s Foreign Commercial Service Officers stationed in Japan and thanked the team, led by Andrew Wylegala. During her remarks, Secretary Pritzker emphasized the important role that U.S. and Japanese businesses play in anchoring our relationship, highlighted the U.S. as a key destination for investment, promoted the upcoming SelectUSA Summit on foreign investment, and highlighted the healthcare and energy sectors as two sectors of critical importance to growth, innovation, and quality of life in both countries. Secretary Pritzker touched on America’s drive to strengthen commercial partnerships, help Japan develop new energy technology, optimize the mix of energy imports, and increase energy conservation. The U.S. anticipates continued high growth in the renewable energy sector, providing excellent opportunities for American firms that have cutting-edge, cost-competitive products and services. 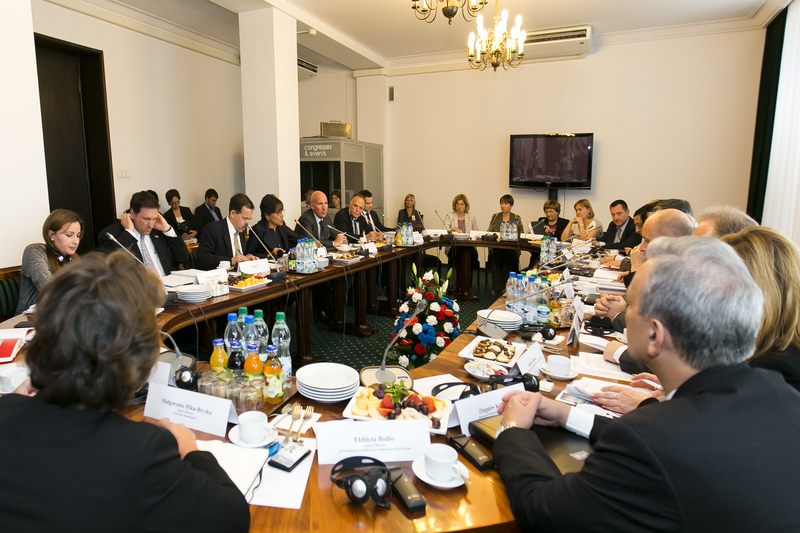 Yesterday, U.S. Secretary of Commerce Penny Pritzker joined Polish Deputy Prime Minister and Minister of Economy Janusz Piechociński in co-chairing an Executive Session of the Economic and Commercial Dialogue (ECD). The ECD is a forum created by the U.S. Department of Commerce and the Polish Ministry of Economy to work specifically on strengthening the ability of our companies and investors to do business in each other's markets. Secretary Pritzker is traveling with a delegation of some of America's top CEOs who are members of the President's Export Council. At yesterday's meeting, Secretary Pritzker and the PEC CEOs addressed collaborative and tangible ways to increase trade and investment between the U.S. and Poland, particularly as Poland's economy continues to grow. Poland currently has the sixth-largest and one of the fastest growing economies in the EU, and growth is projected to continue in 2014. While bilateral trade between the U.S. and Poland has quadrupled over the past 10 years, reaching nearly $8.8 billion in 2013, there is tremendous opportunity for continued growth. One mechanism to increase trade and investment between the U.S. and Poland is the Transatlantic Trade and Investment Partnership (TTIP), which is currently being negotiated between the United States and the EU. Once concluded, TTIP will combine the U.S. and EU markets into a stronger transatlantic marketplace, with more than 800 million customers. 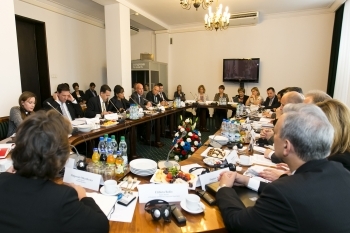 The U.S. considers Poland an important voice in TTIP negotiations. Many of ITA’s senior commercial diplomats from around the globe are meeting in Washington, D.C. to discuss ways to better support business investors and U.S. exporters. In order to support U.S. businesses going global, the International Trade Administration itself needs to be global. That’s why we maintain staff throughout the United States and in more than 70 markets around the world, connecting companies of all sizes to opportunities in the international marketplace. Technology has helped us execute our mission across borders, between time zones, and through language barriers. But just like we tell our clients seeking overseas partners, sometimes there’s no substitute for an old-fashioned face-to-face meeting. That’s why I am excited about our Global Markets Global Meeting this week, bringing together ITA’s senior Commercial Service staff from the United States and around the world to share best practices, learn about new opportunities, and connect with the people who are making commerce happen – people we sometimes only know by email. It’s been more than 10 years since our last meeting of this magnitude, and this week’s event will enable us to better execute our mission and understand new methods to better support our clients. Not only is South America the birthplace of soccer greats and the location of natural wonders, it is also an important and rapidly growing source of foreign direct investment (FDI) to the United States. According to the U.S. Commerce Department’s Bureau of Economic Analysis (BEA), more than 85,000 men and women go to work each day at South American companies operating in the United States. The SelectUSA South America Road Show this week connected U.S. economic development organizations (EDOs) directly with inversores and investidores in Santiago, Chile; Sao Paulo, Brazil; and Bogota, Colombia to build opportunities for even more South American companies to succeed in U.S. cities and regions. 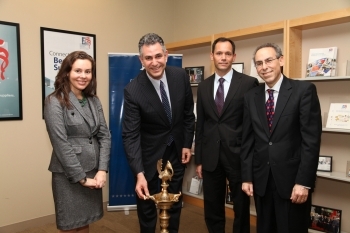 Why did SelectUSA’s first South American Road Show focus on Chile, Brazil, and Colombia? These three countries accounted for nearly a quarter of inward investment from Latin American sources in 2013. Brazil is the largest source of investment from South America, with a total stock of nearly $15 billion in 2013. Brazilian companies such as JBS, Embraer, Braskem, and Chilli Beans have made significant investments in the United States over the past several years. The annual growth rate of Brazilian investment averaged 19.6 percent between 2009 and 2013, making Brazil the ninth-fastest global source of investment to our country. There is robust interest from a diversity of sectors: 325 Brazilian firms took part in our seminar and one-on-one meetings with EDOs. As of 2013, the stock of FDI from Chile into the United States stood at $983 million. Investment from Chile, with which we have a Free Trade Agreement (FTA), has been growing at a compound annual growth rate of 11.9 percent since 2009. More than 130 Chilean firms registered for the Road Show, and we were joined by Arauco and Elecmetal – two well-known Chilean companies who shared their experience investing in the United States. Colombia, another FTA partner, was the source of over $2 billion of FDI stock in the United States as of 2013. A recent example includes Fehr Foods, a subsidiary of Grupo Nutresa, which announced earlier this year that it will invest an additional $32 million and create 105 jobs in its U.S plant. Many more Colombian firms are looking to find success in the United States, as evidenced by the 190 participants in the Road Show in Bogota. FDI from Colombia to the United States from 2009 to 2014 grew at a compound annual growth rate of 14.6 percent. The commercial relationship between United States and India has long stood as a core pillar of the alliance between our two countries. The United States is committed to reinvigorating ties with India and expanding our economic partnership. That is why U.S. Secretary of Commerce Penny Pritzker traveled to India this week, where she joined U.S. Secretary of State John Kerry for the U.S.-India Strategic Dialogue in New Delhi. Their trip marks the first U.S. Cabinet-level visit to New Delhi since the new Indian government was elected. Earlier this week, Secretary Pritzker visited Mumbai for meetings with Indian business leaders to discuss new avenues to reinvigorate economic ties between our two nations. 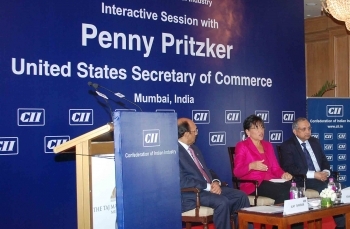 While in Mumbai, Secretary Pritzker delivered remarks at an event hosted by the Confederation of Indian Industry (CII), focused on the U.S. commitment to partner with the newly-elected Indian government, especially in areas of infrastructure, manufacturing, and business investment. Founded over 115 years ago, CII is one of the most important business groups in India and plays an active role in India’s development process. As part of efforts to advance the U.S.-India economic partnership, Vinai Thummalapally and Chairman & Managing Director of Export-Import Bank of India Yaduvendra Mathur signed a Memorandum of Intent (MOI) between SelectUSA and the India’s Export-Import Bank. This MOI will encourage collaboration to attract Indian investment to the United States. SelectUSA is the first U.S. government-wide program to promote and facilitate business investment in the United States. Export-Import Bank of India directly supports Indian foreign direct investments abroad. Today, Secretary Pritzker co-hosted the first ever SelectUSA Summer Forum with U.S. Representative Frank Wolf (VA-10) at the U.S. Capitol Visitor Center. Over 200 business leaders across a multitude of industries attended the Summer Forum to discuss how bringing manufacturing and other services back to the United States – a process called “reshoring” – makes practical and economic sense. 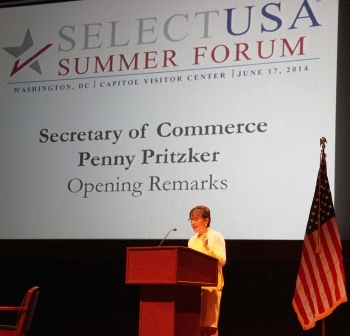 At the SelectUSA Summer Forum, Secretary Pritzker remarked that America’s greatest strengths – its hardworking, diverse, and educated workforce, strong protection of intellectual property rights, predictable and transparent legal system, relatively low taxes, highly developed infrastructure, and access to the world's most lucrative consumer market – have led to a strong trend of reshoring and reinvestment in America. Additionally, Secretary Pritzker praised the Commerce Department’s primary vehicle for attracting job creating investment into the U.S. – SelectUSA – for its achievements in promoting, attracting, retaining, and expanding investment to and within the United States. Attendees also heard from U.S. Representative Frank Wolf, an advocate for exporting and reshoring, House Democratic Whip Steny Hoyer, and Jeff Fettig, CEO of the Whirlpool Corporation, who spoke about his company’s experiences moving jobs back to the United States and the resulting creation of jobs in the local economy. An initiative established in 2011 by President Obama, SelectUSA acts as an advocate for business investment in the United States as well as a single point of contact for investors ready and looking to create jobs and establish production in America. Since its inception just two years ago, SelectUSA has facilitated over $18 billion in new investments for the United States and serviced over 1,000 potential investors this past year alone, bolstering America’s long-standing position as the world’s largest recipient of foreign direct investment. Announcing the "Reinvesting in America, Creating Jobs at Home" SelectUSA Summer Forum on June 17th at the Capitol Visitor Center Congressional Auditorium. From large multinational corporations to family-owned small businesses, U.S. firms are discovering that bringing manufacturing or services back to the United States makes economic sense. Join us to learn about the latest trends, discover resources to help businesses make the move, and hear directly from companies that have reshored successfully. NOTE: This event is FREE but only registered individuals will be admitted to the event. See the agenda and sign up today! Business leaders from across the spectrum and across the world are making new investments here. Individually their stories are compelling, and they are echoed in data from our Bureau of Economic Analysis and captured in a joint report issued by the Department of Commerce and the White House. For example, business fixed investment from companies choosing to grow and invest in the United States accounts for more than 20 percent of the rebound in real GDP since mid-2009, and global investors have played a large part. 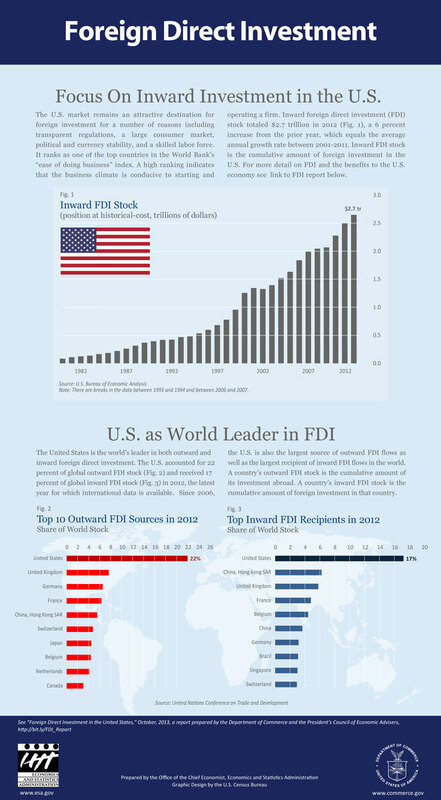 Since 2006, the United States has been the world’s largest recipient of foreign direct investment (FDI). And FDI inflows have swelled, totaling $1.5 trillion between 2006 and 2012. For 2013 alone, FDI inflows totaled $193 billion up from $166 billion in 2012. These investments are good for our economy, for investors, and for workers (such as the 5.6 million who work for U.S. affiliates of foreign firms and have average annual compensation of $77,000). We know this because the evidence is clear in the data. And while it is important to focus on the value of the inward investment and the jobs and growth that brings to our economy, it is also important to take a look at the data that tells us this, as well as the data which informs businesses when they decide to select the USA. Guest blog post by Amy Zecha, International Investment Specialist with SelectUSA. Her portfolio covers Central and Eastern Europe, including Germany. SelectUSA just finished another successful event at the Hannover Messe manufacturing trade fair – the largest in the world – and now we’re gearing up for another big event in Germany. In September, we’ll be participating in Automechanika, a global trade show for the automotive industry. We hope you’ll join us! It’s been a great couple of months for German investment in the United States, and we’ve had some exciting news in the auto industry. In a post last month, ITA’s Tradeology blog highlighted some impressive figures – including the 115% growth in U.S. auto exports of passenger vehicles between 2009 and 2013. It is therefore no surprise to see international automakers – such as Germany’s BMW – continue to grow their U.S. manufacturing operations. 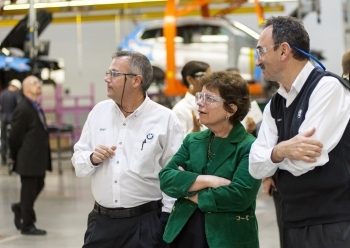 At the end of March, Commerce Secretary Penny Pritzker joined BMW officials and others in Spartanburg, SC in celebrating the start of production of the X4 – and the announcement of the brand new X7. The addition of this model line will make Spartanburg BMW’s largest manufacturing facility in the world. BMW, as a business, knows the value of manufacturing in the United States, and also the advantages of using the U.S. as an export platform. Today, BMW is one of the top auto exporters in the United States. More than half of all the cars produced by BMW at their Spartanburg plant are shipped to other markets beyond our borders. BMW has clearly harnessed the power of U.S. manufacturing and successfully coupled it with the export opportunities offered by U.S. trade agreements to maximize the potential of their U.S. operations. This is just one case study of German success in the U.S. market. Success comes in many sizes - sometimes it's the small or medium-sized enterprise (SME) that makes the commitment to the United States, like PTF Pfuller, a manufacturer of precision parts and assemblies for the semiconductor, food, medical technology, laser and aerospace industries. The CEO, Mr. Oliver Zintl spent two years working with Jenny Trick of Racine County Economic Development Corporation, after an initial meeting at the USA Investment Center organized by SelectUSA and CS Germany at Hannover Messe 2011. PTF established its U.S. division in Sturtevant, Wisconsin in August 2013 with initial plans to start with a small sales staff – but then noted the potential to add manufacturing and a distribution center within five years, creating at least 50 jobs. PTF cited the tremendous work of Racine County and Milwaukee 7 (a regional economic development organization), as well as the central location, access to existing customers in the region, and the quality of the Gateway Technical College – which offers the potential for a nearby source of talent for the company. Editor's note: This has been cross-posted from the White House's Blog. Today, Lufthansa Technik announced a significant new investment in Puerto Rico that demonstrates how efforts to deploy the full resources of the federal government to win job-creating investments in U.S. states and territories pay off. Through the advocacy of several high-level U.S. officials, including the Vice President and the Secretary of Commerce, as well as the work of SelectUSA, the government of Puerto Rico was able to secure this new investment, which will create up to 400 permanent jobs and strengthen Puerto Rico’s burgeoning civil aviation sector. Lufthansa Technik, a wholly owned subsidiary of Germany-based Lufthansa AG, is making a significant new investment in Puerto Rico to build a maintenance, repair, and operations facility. Thanks to the persistent support of the Administration through our SelectUSA investment initiative, local efforts led by Governor Garcia Padilla of Puerto Rico, and the strengths of Puerto Rico’s growing aviation industry, the United States won this new investment despite strong competition. SelectUSA – launched in 2011 and housed in the Department of Commerce – is the first-ever federal effort to bring job-creating investment from around the world to the United States in partnership with state and local economic development organizations. 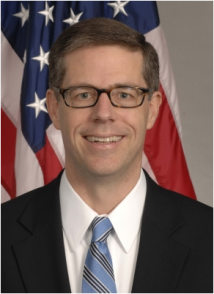 Today, Ambassador-led teams at our posts overseas directly support foreign investors looking to make investments in the U.S. by providing resources and information, and when needed, connecting them to investment experts at the Department of Commerce and throughout the SelectUSA interagency network. Each investor, and investment case, gets tailor-made attention from our case managers at SelectUSA, who rely on ombudsman efforts to answer questions, as well as a sophisticated advocacy network that leverages key Administration officials all the way up to the President of the United States. Lufthansa is a perfect example of our coordinated efforts to bring job-creating investment here to the United States. In addition to Vice President Biden and the Secretary of Commerce and her team, SelectUSA involved other key federal officials, and coordinated with several federal agencies to provide the needed assistance to secure the project. And, when it came time to seal the deal, SelectUSA coordinated an effort across the federal government, including the support of the President’s Taskforce on Puerto Rico, to present Lufthansa with the case for locating their investment in the United States. The Lufthansa investment is yet another example that demonstrates that the United States is an increasingly attractive location for job-creating business investment from around the world. Last year, for the first time in a decade, global business executives ranked the United States the number one destination for foreign investment. And the Department of Commerce released new data showing that foreign direct investment flows into the United States and our territories rose from $160 billion in 2012 to $187.5 billion in 2013. With our booming natural gas sector, our skilled workforce, our status as home of the some of the top research universities and innovation hubs, and our resurgent manufacturing communities, the United States is primed for business investment. Businesses increasingly cite the U.S. open investment climate, rule of law, the ability to efficiently export their goods, access to high-quality supply chains, and proximity to robust consumer markets as key factors to locate their operations in the United States. And now, with the help of SelectUSA, the federal government is undertaking a coordinated and concerted effort to showcase our strengths and make the case with even more investors that the United States should be their top choice. To put it simply, the United States is Open for Business. Jeff Zients is Director of the National Economic Council and Assistant to the President for Economic Policy. Secretary Penny Pritzker is the Secretary of Commerce. This month, SelectUSA is really upping our game when it comes to online engagement around investment. We hope you’ll join the conversation on Twitter at #SelectUSA! Our colleagues across the Commerce Department will be sharing their thoughts on how innovation, data and hard work contribute to job creation. We’re collaborating with our friends at the State Department’s Economic & Business Affairs Bureau, as well as with our Commerce and State colleagues throughout the United States and globally at our embassies and consulates. This is a big conversation, but most importantly, we hope to be hearing from YOU. We’re broadening the conversation at #SelectUSA to talk about how investment in the United States drives job creation and how we can work together to attract even more jobs. Did you know that, as of 2011 (the most recent data available), U.S. subsidiaries of foreign companies employed more than 5.6 million workers and paid an average annual salary of $77,600? According to preliminary estimates from the Bureau of Economic Analysis, foreign direct investment (FDI) inflows totaled $187.5 billion in 2013, rising from $160.1 billion in 2012. The United States also recently took back the top spot in A.T. Kearney’s FDI Confidence Index. What do these numbers mean to you? Are you an investor looking to expand your operations in the United States? Are you seeking to attract more investment to your town, city, county or state? How can SelectUSA assist you? U.S. Secretary of Commerce Penny Pritzker wrapped up her Middle East trade mission in Qatar, where there are many opportunities for U.S. businesses due to the country’s growing economy as well as investments in infrastructure and transportation. As part of the National Vision 2030, Qatar’s broad strategy for growth and development, the country is focused on making meaningful advances in education, sustainability, and economic diversification. Qatar is currently preparing to host the 2022 FIFA World Cup, and is therefore undertaking numerous new construction projects, renovations and upgrades to prepare for the games and the influx of visitors they will bring. With more than $150 billion in infrastructure investments needed before 2022, U.S. companies are well-positioned to help Qatar meet its development goals. Twenty-one such companies are accompanying Secretary Pritzker on her trade mission to the Middle East, and they have been meeting with Qatari leaders to explore business opportunities. 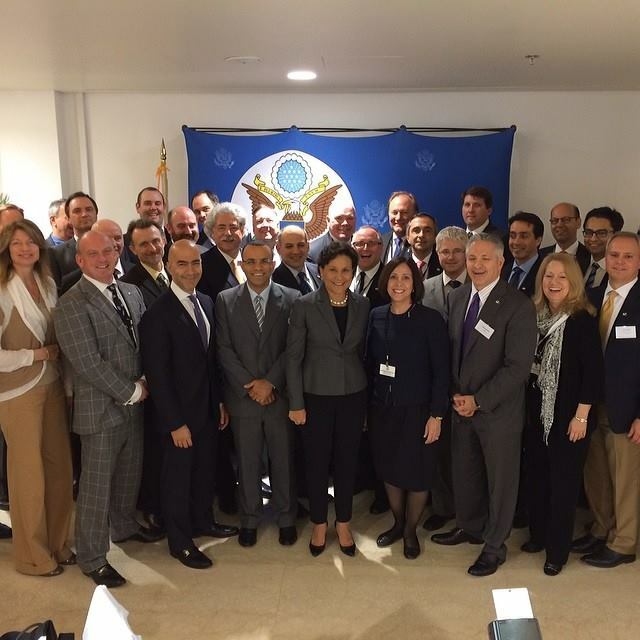 On Thursday, Secretary Pritzker and the business delegation met with His Excellency Eng. Essa Bin Hilal Al-Kuwari, President of the General Water and Electricity Corporation (Kahramaa). They discussed how U.S. companies can get more involved in future Kahramaa water, power, and smart grid projects. They also met with Nasser Al Mawlawi, President of the Public Works Authority (Ashghal), which is leading publically-funded road projects in advance of the 2022 World Cup. Ashgal has already selected several U.S. engineering and construction firms, including AECOM Technology Corporation, a member of the trade mission’s business delegation, to lead major projects. Secretary Pritzker also met with Hassan Al Thawadi, Secretary General of the Supreme Committee for Delivery and Legacy, who is in charge of preparations for the World Cup. Secretary Pritzker congratulated Al Thawadi on the successful bid to host the World Cup and highlighted the close collaboration between U.S. and Qatari companies on major infrastructure projects related to the event. Attracting Qatari investment to the U.S. was also a big focus of the visit. On Thursday, Secretary Pritzker met with Ahmed Al Sayed, CEO of the Qatar Investment Authority (QIA), founded by the Qatari government to diversify the country’s economy. She talked about the United States as an investment destination and highlighted SelectUSA, a Commerce-led federal initiative to promote business investment, as a resource for Qatar as the country seeks to expand its investment portfolio. Secretary Pritzker reached out to government leaders on her visit as well, notably His Highness Sheikh Tamim Bin Hamad Al Thani, Emir of Qatar, as well as Sheikh Abdullah bin Nasser Al Thani, Prime Minister and Minister of Interior. She emphasized the strong bilateral relationship between the U.S. and Qatar and the Commerce Department’s commitment to enhance our commercial relationship. Also on Thursday, Secretary Pritzker participated in an armchair discussion hosted by AmCham Doha and the National U.S.-Arab Chamber of Commerce (NUSACC). During the discussion, Secretary Pritzker expressed the Commerce Department’s strong support for U.S. companies working to help Qatar reach its development goals. This week’s trade mission has been a successful effort to connect U.S. businesses with export opportunities in the United Arab Emirates, the Kingdom of Saudi Arabia, and Qatar. It demonstrates the United States’ commitment to a sustained economic partnership in the Gulf region. With rapidly growing economies and an expanding middle class driving demand for U.S. products and services, countries in the Gulf region are ramping up investments in transportation, renewable energy, and other infrastructure projects. That is why U.S. Secretary of Commerce Penny Pritzker is leading a trade mission to the region this week, her second since being sworn in last June. Along with a delegation of 21 export-ready U.S. companies, Secretary Pritzker started her trip in Abu Dhabi, United Arab Emirates, a country with which the U.S. has a growing trade relationship. As the UAE undertakes major investment in its infrastructure and transportation systems, there are tremendous opportunities for U.S. firms to serve as strong partners. On Sunday morning, Secretary Pritzker led the trade mission’s business delegation on visits to two government-established entities that are making investments in infrastructure, in order to help these U.S. companies explore possible export or investment opportunities in the UAE. First they met with Khaldoon Mubarak, the CEO of Mubadala, a development company that is investing in renewable energy, educational facilities, transportation, and logistics. Mubadala has already partnered with a number of U.S. companies, including General Electric, Boeing and Lockheed Martin. The delegation also visited the Abu Dhabi Water and Electricity Authority, which currently serves approximately 40 percent of the UAE’s population and is working to expand its capacity. 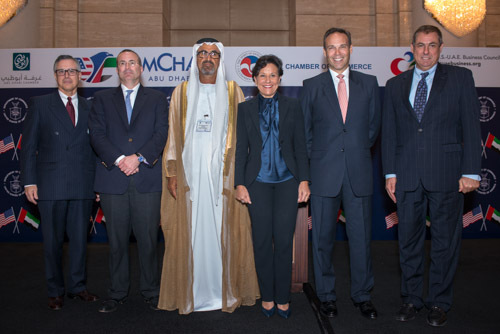 Secretary Pritzker then delivered remarks to business and government officials at a luncheon hosted by the United States–United Arab Emirates Business Council, the United States Chamber of Commerce, AmCham Abu Dhabi, and the Abu Dhabi Chamber of Commerce & Industry. In her remarks, she highlighted the growing U.S.-UAE bilateral trade relationship, noting that U.S. exports to the UAE have more than doubled since 2009. Secretary Pritzker underscored that the companies on the trade mission are eager to do business in the UAE, and to serve as partners on a number of infrastructure projects the country has undertaken in areas such as renewable energy and transportation. U.S. Secretary of Commerce Penny Pritzker today released the fiscal year 2015 budget request for the U.S. Department of Commerce. The FY15 budget request supports and builds on President Obama’s vision for creating economic opportunity for all Americans, and includes critical funding for key Commerce priorities: promoting trade and investment, spurring innovation, and fueling our data-driven economy. The $8.8 billion FY15 budget request directly aligns with the Department’s “Open for Business Agenda,” which reflects Commerce's role as the voice of business and the Obama Administration’s focus on economic growth and job creation. The Commerce Department’s fiscal year 2015 budget reflects the Department's role as the voice of business in the Administration by making critical investments in our long-term growth and competitiveness. The budget prioritizes high-tech manufacturing and innovation, U.S. trade and investment, infrastructure, skills training, unleashing government data and gathering and acting on environmental intelligence, while also cutting red tape to help businesses grow. Promoting Trade and Investment: To promote exports and greater foreign investment in the U.S., the budget includes $497 million for the International Trade Administration (ITA), an eight percent increase over the 2014 enacted level. Funding for ITA includes $15 million to accelerate operations of the Interagency Trade Enforcement Center (ITEC), an interagency effort to address unfair trade practices and barriers to boost U.S. exports, and $20 million to expand SelectUSA, which promotes re-shoring and actively brings job-creating investment to the United States from around the world. Spurring Innovation: To foster a more innovative U.S. economy, the budget will increase regional and national capacity for innovative manufacturing, be the principal defender and champion of the digital economy, continue to support research and development (R&D) that leads to transformative changes in technology, and promote intellectual property policy that supports innovation. Fueling a Data-Driven Economy: Data powers the 21st century economy, and Commerce Department data touches every American and informs business decisions every day. Gathering and Acting on Environmental Intelligence: The Department’s environment agenda aims to help communities and businesses prepare for and prosper in a changing environment. The budget provides $2 billion to fully fund the National Oceanic and Atmospheric Administration’s (NOAA’s) next generation of weather satellites, which are critical to its ability to provide accurate information to decision-makers throughout the government and private sector, as well as time-sensitive weather forecasts and warnings that help protect lives and property. Opportunity, Growth, and Security Initiative: The President is also proposing the Opportunity, Growth, and Security Initiative, which will be fully paid for with a balanced package of spending and tax reforms. It will demonstrate how, by simply changing a few tax provisions and reforming spending programs, Congress could achieve significant economic goals in research, education, manufacturing and skills training. The initiative is consistent with the model established in Murray-Ryan, providing equal dollar-for-dollar increases above the current law discretionary spending caps for both defense and non-defense. More information can be found at the Commerce Department's press release U.S. Secretary of Commerce Penny Pritzker Announces Fiscal Year 2015 Budget Request. In 2011, President Obama launched SelectUSA, the first-ever U.S. government-wide initiative to attract foreign direct investment (FDI) in the United States, with the hopes that the Department of Commerce would help facilitate both foreign and domestic business relationships and make FDI a diplomatic and foreign policy priority. We took an enormous step forward three months ago, when the Commerce Department hosted the first-ever SelectUSA Investment Summit in Washington, DC. The summit was such a success that it sold out, and more than 1,300 business and government leaders from nearly 60 countries and economic development organizations from 48 states, the District of Columbia and three territories gathered to learn about the advantages of doing business in the United States and to explore investment opportunities. Perhaps most importantly, the Summit helped match potential investors with economic development organizations to help revitalize American communities and create new job opportunities. Thankfully, we can continue to build upon the success of the Summit, now that the budget deal has been approved. The agreement will allow up to $7 million to expand and enhance the program, and we at the Commerce Department are pleased to have this extra support to bring more companies to our shores. In fact, the U.S. has welcomed investment to our shores for centuries. Our market has provided long-term stability and unmatched returns for investors. Today, the United States is the largest recipient of FDI in the world, and in 2012 alone, more than $160 billion dollars of FDI flowed here. Total foreign stock and assets are measured not in billions, but in the trillions of dollars. Clearly, FDI is an important contributor to our economy. Secretary Penny Pritzker traveled to Westerville, Ohio yesterday to deliver a speech highlighting the Obama Administration’s economic growth agenda and the Department of Commerce’s priorities. 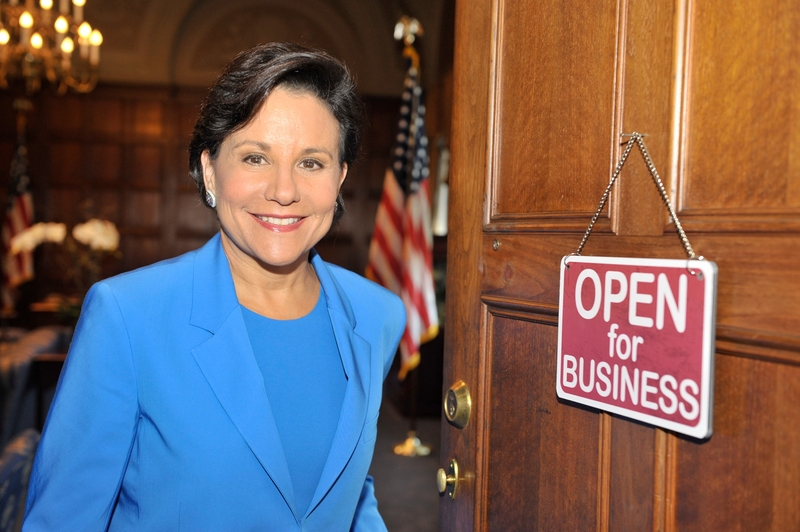 Secretary Pritzker announced a new strategic vision for the Department, the “Open for Business Agenda,” November 14. In Ohio, Secretary Pritzker toured and delivered remarks at Lake Shore Cryotronics, an international leader in the development of cryogenic temperature sensors and instrumentation. 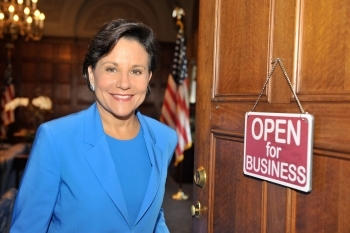 Promoting trade and investment is a major part of Secretary Pritzker’s “Open for Business Agenda.” Nationwide, America’s businesses are exporting: the United States hit a record $2.2 trillion dollars in exports last year, up $600 billion dollars from 2009 when President Obama launched his National Export Initiative. Lake Shore Cryotronics, for example, generates 60 percent of sales from exports. Nearly 10 million U.S. jobs are now supported by exports, up 1.3 million since 2009. 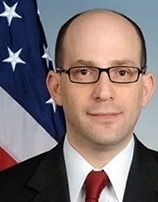 But the United States still under-exports, which is why the Secretary is gearing up to launch NEI 2.0, which will aim to help more U.S. companies sell their goods and services to more markets around the world. In order to achieve greater economic growth and create more good jobs, Secretary Pritzker talked about the need to attract more foreign investment to the United States. According to Columbus 2020, an economic development organization for the 11-county Columbus Region, about 39,000 people in Central Ohio are employed by foreign-owned companies. But as of 2011, 5.6 million jobs nationwide million jobs are supported by foreign direct investment, supporting $437.8 billion in wages to U.S. employees. Global businesses want to be here in the United States because of our stable rule of law, intellectual property protections, solid financial markets, world-class universities, strong consumer base, and our low-cost and abundant energy. That is why President Obama launched SelectUSA at the Commerce Department in 2011. SelectUSA has been working with foreign CEOs and economic development groups across the country to put even more deals in the pipeline. Secretary of Commerce Penny Pritzker wrapped up the inaugural SelectUSA 2013 Investment Summit this afternoon, following two high-impact days of meetings and discussions among senior government officials, major business executives, global economic experts and U.S. economic development officials about strategies to increase foreign direct investment (FDI) in the United States. Secretary Pritzker also opened the final day of the Summit, where she announced changes to the eligibility requirements for the Manufacturing Council that will allow representatives from U.S. subsidiaries of foreign-owned or controlled firms to become members. The expanded eligibility rules will add new perspectives to the Council, which advises the Commerce Secretary on policies and initiatives to increase FDI in the U.S. manufacturing sector, including SelectUSA. U.S. Secretary of State John Kerry delivered remarks focused on deepening U.S. economic alliances around the world. Following his address, U.S. Trade Representative Michael Froman moderated a panel with Tennessee Governor Bill Haslam, BMW North America CEO Ludwig Willisch, and Caterpillar CEO Doug Oberhelman on how global companies can use their U.S. operations as an export platform by taking advantage of free trade agreements and bilateral investment treaties. View the archived webcast here. Guest post by Ambassador Vinai Thummalapally, Director of SelectUSA. Cross-posted from Tradeology, the official blog of ITA. President Obama has been emphatic that the United States remains the best place in the world to do business. Today at the SelectUSA Investment Summit, he reiterated that message to 1,000 business leaders from nearly 60 countries. “When you bet on America, that bet pays off,” the president said as he closed his keynote address. Your country is your product when you’re attracting foreign direct investment. At the Summit today, we showed the world that the United States is the absolute best product on the market. Attendees began making connections as soon as the doors opened. Representatives from 47 states, three territories, and Washington, D.C., showed off investment opportunities around the country. Treasury Secretary Jack Lew highlighted many advantages a company has when it invests in America – including robust infrastructure and low barriers for entrepreneurs. CEOs from major national and international companies echoed those messages throughout the day. “We have the most resilient capital markets in the world,” said Larry Fink, CEO of BlackRock. View the archived webcasts here. A new report from the U.S. Commerce Department and the President's Council of Economic Advisors spotlights the array of factors that have made the U.S. the destination of choice for foreign direct investment (FDI). The joint report, released at the inaugural SelectUSA 2013 Investment Summit, also documents the positive impact FDI is having on the U.S. economy, including job creation, higher research and development spending and export growth. The U.S. is the largest recipient of FDI in the world, with stock of more than $2.6 trillion dollars–including $166 billion that flowed into the country in 2012. Moreover, companies around the world now consider the U.S. to be the nation with the top FDI prospects globally. 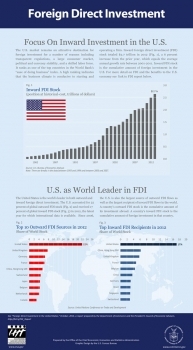 The United States has been the world’s largest recipient of foreign direct investment (FDI) since 2006. Every day, foreign companies establish new operations in the United States or provide additional capital to established businesses. With the world’s largest consumer market, skilled and productive workers, a highly innovative environment, appropriate legal protections, a predictable regulatory environment, and a growing energy sector, the United States offers an attractive investment climate for firms across the globe. Since I was confirmed as Secretary of Commerce, I’ve been meeting with business leaders, entrepreneurs, and foreign leaders to let them know that America is “open for business.” The United States is one of the most desirable places to do business; our $16 trillion economy, with its productive workforce and diverse consumer base, could not do what it does without domestic as well as foreign investment. Yesterday, I participated in the White House Forum (Forum) on Global Investment to highlight the administration’s support for, and benefits of, foreign direct investment (FDI) in the United States. For the meeting, I was joined by Acting Deputy Secretary of Commerce Pat Gallagher, Under Secretary of Commerce for International Trade Francisco Sánchez, Assistant Secretary of State for Economic and Business Affairs Jose Fernandez, and 21 foreign ambassadors and representatives to highlight the United States’ whole-of-government approach to attracting foreign direct investment. Part of our discussion focused on the growth of FDI in sectors such as manufacturing, machinery, and scientific and technical services. In fact, FDI in the United States totaled nearly $168 billion last year. And just recently, the consulting firm A.T. Kearney published its annual FDI Confidence Index, with the United States ranked #1 on this list for the first time since 2001. Pre-registration is now open for the SelectUSA 2013 Investment Summit! This first-ever event will take place in Washington, DC on October 31 and November 1. The two-day SelectUSA 2013 Investment Summit will connect international and domestic investors and firms with economic development organizations (EDOs) from across the country in an effort to promote investment here and support the creation of American jobs. Through a series of presentations and panel discussions, Summit participants will hear from world-class business leaders, senior Administration officials, and industry and technical experts. The Summit will feature an exhibition area where EDOs can showcase their business opportunities. Participants will also learn what Federal resources are available for investing in the United States. Another key component of the Summit will be matchmaking sessions, with opportunities for extensive networking. SelectUSA, located within the International Trade Administration of the U.S. Department of Commerce, was established by President Obama in 2011. This Presidential initiative is charged with leading federal government efforts to promote the United Sates as the premier global investment destination and facilitate investment in the nation. SelectUSA provides counseling to the global investment community, serves as an ombudsman for investors, and advocates for U.S. cities, states, and regions competing for global investment. Yesterday, Acting Secretary Blank met with a group of Brazilian CEOs to hear their priorities for doing business with the U.S. and to propose possible areas for close collaboration with American businesses. 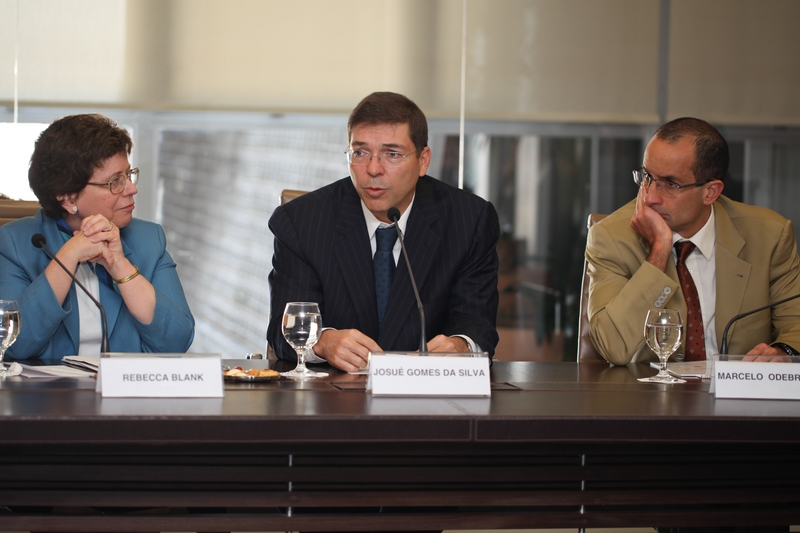 One area in which U.S. and Brazilian firms can work together is on infrastructure development, which is one reason why Acting Secretary Blank is currently leading a trade mission of 20 U.S. firms in a wide range of infrastructure industry sectors to Brazil, Colombia and Panama. These companies offer everything from cutting-edge technologies to top-notch services in engineering, management consulting, and more -- and they are well equipped to help Brazil meet its robust goals for infrastructure improvements. Acting Secretary Blank emphasized the importance of a strong bilateral investment relationship -- many global manufacturers, including some in Brazil, are now looking to return manufacturing operations to the U.S., to expand operations here, or to invest in the U.S. for the first time. That´s because there are a host of factors that make America a very attractive place to do business: low domestic energy costs and a stable supply of energy, high labor productivity, strong research institutions that can serve as partners in developing new products, intellectual property protections, and a stable business investment environment. Deputy Secretary of Commerce Rebecca Blank visited BMW Manufacturing today and delivered remarks on the President’s plan to make America a magnet for jobs and manufacturing. The Deputy Secretary highlighted the President’s proposals for a new Investing in Manufacturing Communities Partnership, the SelectUSA program, and the National Network for Manufacturing Innovation. Blank’s visit comes on the heels of President Obama’s State of the Union Address, in which he outlined a broad agenda for revitalizing U.S. manufacturing, spurring innovation, and accelerating export growth. During her remarks, Blank emphasized key Commerce programs that will drive President Obama’s “Make America a Magnet for Jobs by Investing in Manufacturing” plan. For example, Commerce is going to lead a team of federal agencies in the new Investing in Manufacturing Communities Partnership. The President has proposed a new program to support communities that do the hard work and analysis to identify key projects that will bolster their ability to attract investment. A competitive process will select communities that have done effective planning but need a little help to build additional assets. For instance, the program could provide matching funds to co-invest in things like a business park or a new tech transfer program with local universities. Local leaders will need to show that they’ve put together a strong plan to attract investments from a particular industry where their community has a comparative advantage. That means they’ll need to collaborate closely across the public and private sectors, local foundations, and local research and teaching institutions. By supporting communities that are actively working to become investment hubs, the program will help entice both manufacturers and their supply chains to come to a particular area. Yesterday, Acting U.S. Commerce Secretary Rebecca Blank traveled to Virginia Beach, Va., where she toured the STIHL manufacturing plant and announced a new initiative to strengthen the economy by supporting American businesses as they make things here in America and create jobs. The Make it in America Challenge is designed to accelerate the trend of insourcing, where companies are bringing jobs back and making additional investments in America. 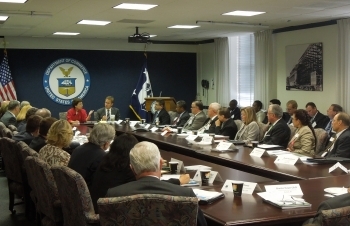 The competition, which is being funded by the Department of Commerce’s Economic Development Administration and National Institute of Standards and Technology Manufacturing Extension Partnership and the Department of Labor’s Employment and Training Administration, will build upon the administration’s bottom-up approach to strengthening the economy and creating jobs by partnering with state, regional and local economies. The national competition will help provide the critical infrastructure, strategic planning, capacity building, technical assistance, and workforce skills training necessary for American communities to be the desired home for more businesses. The Make it in America Challenge builds on the administration’s efforts to encourage companies—large and small, foreign and domestic, manufacturers and services firms—to increase investment in the United States. Acting Secretary Blank also highlighted two ongoing efforts by the Department of Commerce to attract foreign direct investment. SelectUSA, a program the president launched last year, continues to showcase the United States as the world’s premier business location and to provide easy access to federal-level programs and services related to business investment. Also, Commerce’s Commercial Services officers have been trained to help foreign investors who want information about how to invest in the U.S and who want to link up with local and state economic development leaders to create jobs in America. This morning, I joined economic development leaders from around the country to discuss ongoing efforts to create jobs and grow the U.S. economy. The Economic Development Forum was hosted by the U.S. Commerce Department’s SelectUSA initiative, in partnership with the White House Business Council and the International Economic Development Council (IEDC), the world’s largest professional organization of economic development practitioners. The forum provided an opportunity to discuss the Obama administration’s efforts to support U.S. businesses and encourage companies to bring good jobs back to America, a trend called insourcing. Both American and international firms are increasingly looking for opportunities to invest in the U.S. And businesses are not only choosing to bring jobs back, but they are also making decisions to expand here instead of shipping jobs overseas. These investments mean that more products will be made in America. That means more jobs and greater economic security for families across this nation. U.S. Commerce Secretary John Bryson today announced the 16 companies that will join him on a business development mission to India, his first as Commerce Secretary. During the mission, Secretary Bryson will meet with senior-level Indian government officials to advocate for U.S. export opportunities in India’s rapidly expanding infrastructure sector, and promote investment opportunities in America – both key priorities of the Obama Administration. 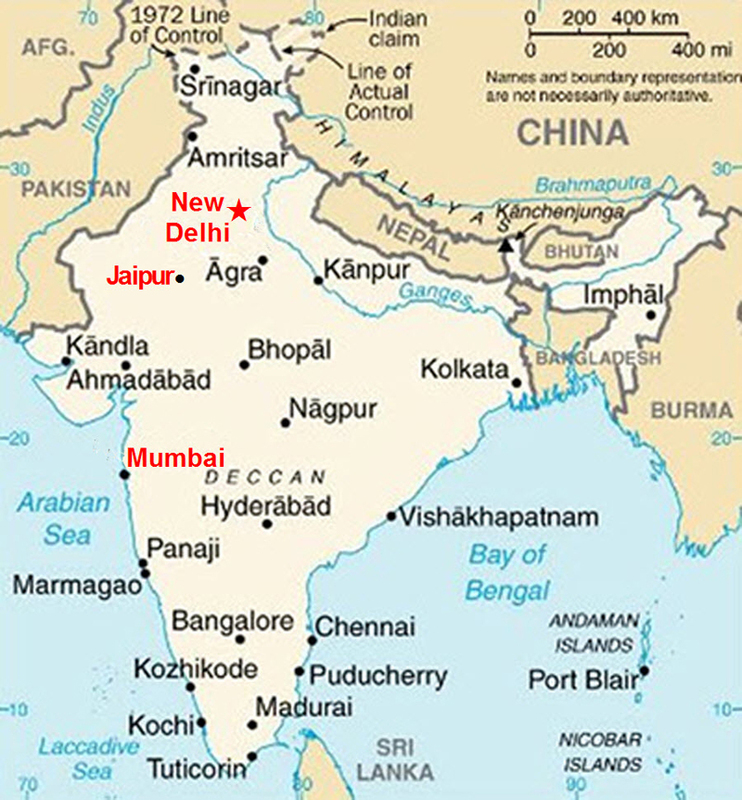 The mission will take place March 25-30 with stops in New Delhi, Jaipur and Mumbai. The trade mission supports President Obama’s National Export Initiative goal of doubling U.S. exports by the end of 2014 to create more good-paying jobs. Last week, on the two year anniversary of the creation of the NEI, the Commerce Department released new data showing that jobs supported by U.S. exports increased by 1.2 million between 2009 and 2011, and the value of U.S. exports exceed $2.1 trillion for the first time in U.S. history. The mission also supports efforts to increase investment in the United States through SelectUSA, America’s first national investment advocacy program. In addition, the mission will promote a new national tourism strategy focused on creating American jobs by becoming even more welcoming to visitors from around the world. There are amazing opportunities available to U.S. businesses in India. That’s one of the main takeaways of my successful week-long trade mission focusing on Indian port infrastructure. Case in point: the two-way trade between India and the U.S. grew to $58 billion in 2011, and this upward trend is expected to continue in 2012. The ports trade mission that we just concluded today–a first of its kind in India–was especially successful. Representatives from 12 U.S. organizations joined me on the trip, where we visited three different cities to facilitate as many partnerships as possible. The trade mission participants included dredging companies, port security companies, scanning technology providers, infrastructure, and transportation and logistics companies. 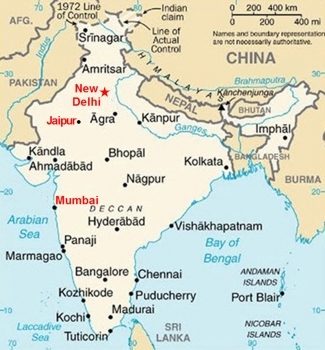 With them the Ports of Baltimore and San Diego also joined to partner with companies and ports in India. Prior to President Obama attending the Democratic Governors Association Meeting, Secretary John Bryson addressed the assembled governors to discuss how the Commerce Department is working across the federal government to make every federal tool available to promote “insourcing” by U.S. companies and to attract more foreign direct investment. Secretary Bryson reiterated the key advantages America has over foreign competitors. For example, the American workforce is among the most productive in the world. He also discussed how America continues to have the best universities, the strongest sources of R&D and manufacturing innovation, excellent supply chains, and the strongest IP protections. He also noted that foreign direct investment rose nearly 50 percent from 2009 to 2010. Bryson then emphasized that through SelectUSA, the Commerce Department wants to partner with more states to attract even more foreign direct investment to the U.S. SelectUSA is the first coordinated federal effort to aggressively pursue and win new business investments in the U.S. It will help investors navigate our rules and procedures and will help advocate for the U.S. when foreign businesses are deciding where to put their next facility and create jobs. SelectUSA is already working with some city and state economic development organizations to produce results. Bryson personally invited the governors and their top economic officials to attend the 1st annual SelectUSA Investment Summit later this year. The Commerce Department will assemble companies from around the world and it will provide an excellent opportunity for states to explain why they are the best place to invest and to hire. Today President Obama visited Master Lock in Milwaukee, Wisconsin and announced that the Department of Commerce will host the first annual SelectUSA Investment Summit, bringing companies from around the world to meet with governors, mayors and local stakeholders, federal agencies, and state and local economic development organizations together to discuss the benefits of investing and growing in the U.S. The Summit will build on the Administration’s efforts to promote investment in the U.S. by providing an annual forum to attract and expand U.S. investment and address questions and issues that companies face when they choose where to invest globally. Launched by Executive Order in June 2011, the Department of Commerce’s SelectUSA program is the first-ever federal effort to help attract, retain, and expand business investment. Historically, U.S. states and cities have found themselves competing against foreign governments to attract business investments, with the federal government playing only a nominal role in the competition for global investment. Rather than providing new incentives for investment, SelectUSA plays the critical role of advocacy, coordination, facilitation, and information-gathering and –sharing. The program has already paid dividends for American workers. Working hand-in-hand with SelectUSA officials, the Michigan Economic Development Corporation, and other local Michigan agencies, Canadian automotive company AGS Automotive recently elected to make an investment in excess of $20 million to add new manufacturing capabilities to permit it to manufacture bumper impact assemblies in Michigan. The new business will likely represent in excess of $100 million in annual sales over the next 5 years and will enable AGS to retain approximately 50 jobs and create over 100 new jobs in Michigan. 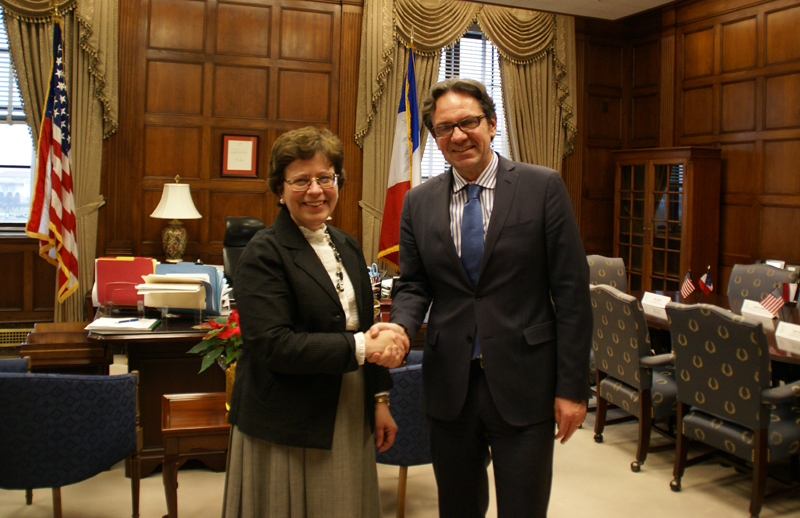 Yesterday, Acting Deputy Commerce Secretary Rebecca Blank met with Frédéric Lefebvre, French Minister for Commerce, SMEs, Tourism, and Consumer Policy, at the Commerce Department to discuss ways to increase cooperation in the U.S.-France commercial relationship. Lefebvre is in Washington briefly before traveling to Miami for the World Symposium of French Trade Advisors on February 9–10. 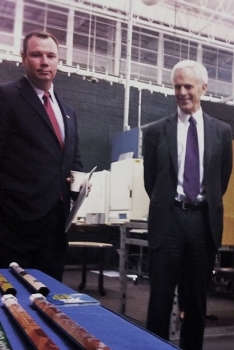 Today, three days after attending the president’s State of the Union address, Commerce Secretary and former CEO John Bryson traveled to Columbus, Ohio, where he toured Entrotech, a manufacturing facility, and met with local business leaders. The Secretary also toured EWI before giving brief remarks about the Department of Commerce’s focus on supporting American manufacturers so they are able to build their products in America and sell them everywhere around the globe. Following his remarks, the Secretary participated in a White House Business Council Roundtable discussion with business leaders. The final stop was at the Battelle Memorial Institute in Columbus, directly adjacent to Ohio States campus, where the Secretary saw old innovations, such as one of the first Xerox copiers, to the latest technologies in development. The Commerce Department’s SelectUSA program is helping ensure that more domestic and foreign firms are investing here in the U.S. We want to build on the momentum that we see in bringing jobs back. That’s exactly what companies like Entrotech are poised to do. They are generating innovative ideas on product design and development that can change entire industries, making them more globally competitive. Acting U.S. Commerce Secretary Rebecca Blank traveled to Warren, Ohio, today to tour Thomas Steel Strip Corporation, a member of the Tata Steel Europe Group and a manufacturer of cold-rolled strips usually used as steel casings for batteries. Thomas Steel employs more than 250 people. After the tour, Blank discussed the importance of strengthening our education, infrastructure and innovation capacity as ways to rebuild our economic foundation, create jobs and enhance our global competitiveness. She also underscored the steps the administration has already taken to achieve these priorities–from investing in community colleges and funding transportation projects across the country, to launching the President’s National Export Initiative and pushing to shorten the time it takes to approve a patent. Blank also highlighted the significance of foreign direct investment (FDI), citing Tata Steel as an example of foreign companies whose investments the U.S. must attract more of to strengthen economic growth and job creation. 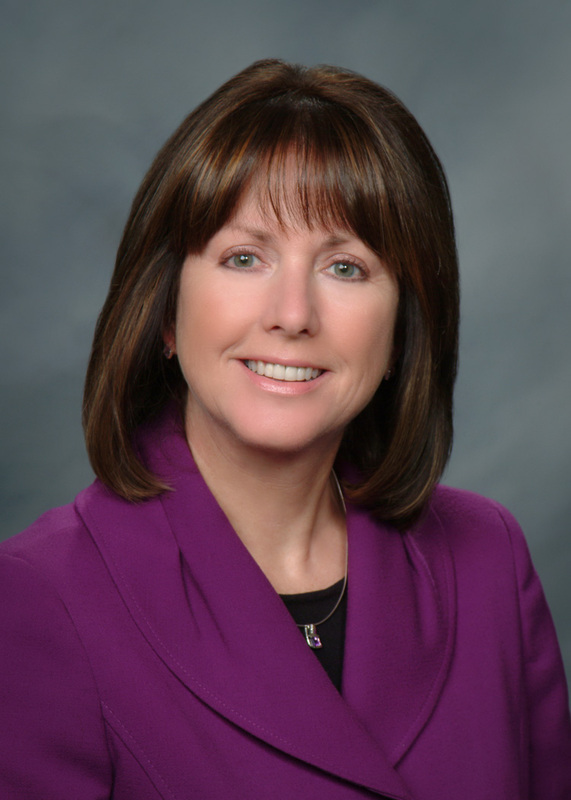 With FDI supporting more than five million American jobs, Blank discussed a new government-wide initiative, housed at Commerce–SelectUSA–which seeks to cut federal red tape for domestic and foreign investors, remove barriers to new investment and boost business growth in the United States. Acting Secretary Blank Hosts Meeting with Local Business Leaders in Martinsville, Va. , Tours Foreign Direct Investment Facility in N.C.
Today, Acting Secretary Rebecca Blank traveled to Martinsville, Va., to host a roundtable meeting with local business leaders. The discussion, part of the Obama Administration’s White House Business Council’s ongoing Winning the Future roundtable event series, is to better communicate with America’s business community about the challenges they are facing and turn that input into concrete action that will improve U.S. economic competitiveness. The meeting was also an opportunity for businesses to learn about help that is available from agencies across the federal government. After the roundtable, she toured the production facility of AlBaad USA with Gov. Bev Perdue and U.S. Rep. Brad Miller in Reidsville, N.C. AlBaad USA is an Israeli-owned wet wipe and cleaning supply company that has made a $35 million investment in its U.S. operation, employing nearly 200 people. After the tour, Blank discussed the importance of strengthening our education, infrastructure and innovation capacity as ways to rebuild our economic foundation, create jobs and enhance our global competitiveness. She also underscored the steps the administration has already taken to achieve these priorities – from investing in community colleges and funding transportation projects across the country, to launching the President’s National Export Initiative and pushing to shorten the time it takes to approve a patent. Blank also highlighted the significance of foreign direct investment (FDI), citing AlBaad USA as an example of foreign companies whose investments the U.S. must attract more of to strengthen economic growth and job creation. With FDI supporting more than 5 million American jobs, Blank discussed a new government-wide initiative, housed at Commerce – SelectUSA – which seeks to cut federal red tape for domestic and foreign investors, remove barriers to new investment and boost business growth in the United States. Launched in June, SelectUSA was created by Executive Order in direct response to concerns the Obama administration has heard from the business community. In addition to its work removing federal-level barriers to foreign investment, SelectUSA also brings together information on federal programs and services available to companies looking to invest in the United States in one, easy-to-access location, supported by a comprehensive website at www.SelectUSA.gov. The website also provides snapshots of the competitive landscape in major U.S. industries and a direct line to state and local economic development agencies. 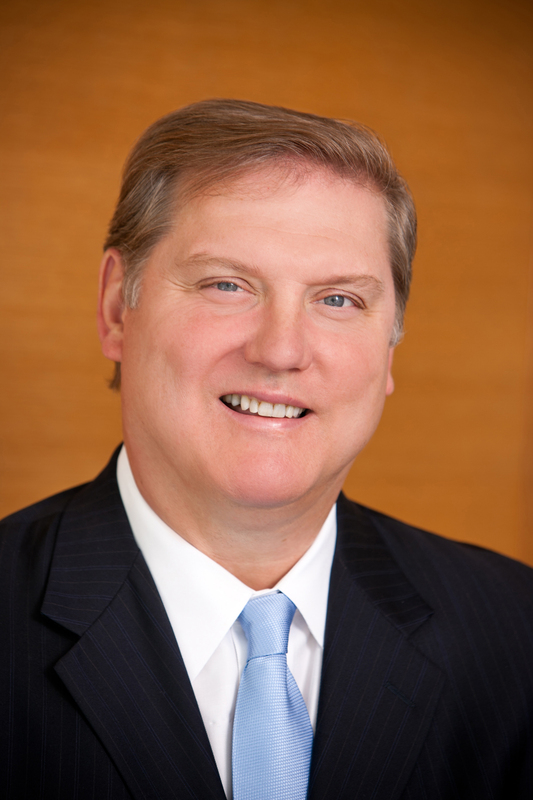 Guest blog by Gary Locke, U.S. Secretary of Commerce. Cross-posted at the White House blog. Business investment in America creates and supports millions of jobs, while generating economic growth and opportunities in communities throughout the United States. Today at the Business Round Table in Washington, D.C., we announced a new initiative – SelectUSA – the first-ever government-wide program to aggressively pursue and win new business investment in the United States by both domestic and foreign companies. America has the most appealing investment environment in the world, with the largest consumer market, an educated workforce, strong intellectual-property protections and open capital markets. More than 5 million Americans are directly employed by foreign companies in the U.S., ranging from Japanese carmakers to British banks to Indian energy and industrial companies. But at a time when competition for business investment is more intense than ever, the U.S. is the only developed economy in the world without a national-level investment program and advocacy program. In recent years we have been losing ground in attracting and retaining business investment to better coordinated foreign competitors. SelectUSA, established by Executive Order of the President, will leverage existing resources of the federal government to ramp up promotion of the U.S. as a prime investment destination to create jobs at home and to keep jobs from going overseas.